Brooklyn, NY — Below the Surface, 440 Gallery’s (13th) annual theme show, is a resonant statement about the power of art to invoke something more than meets the eye. Juried by independent curator and artist Peter Gynd, this exhibit explores the way artists from diverse locations and backgrounds responded to the challenge of using layers of color, form and meaning to address this year’s theme. Work chosen for display throughout the gallery was selected from submissions by artists across the U.S. With a variety of materials and techniques, Below the Surface is a unique statement about the creativity of art makers and their processes. Peter Gynd is an independent curator and fifth generation artist originally from Vancouver Canada. Gynd studied at the Alberta College of Art and Design and has exhibited in both Canada and the US. Notable exhibitions curated by Gynd include a permanent exhibition at the Foundation Center, NY; SPRING/BREAK Art Show; Present Company, NY; NARS Foundation, NY; the Northside Festival, NY; and at the Dynamo Arts Association, Vancouver Canada. Gynd’s exhibitions have been featured in Hyperallergic, The Carnegie Reporter, Blouin Artinfo, and Gothamist. 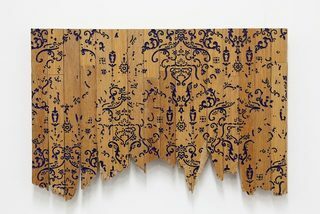 Peter Gynd lives and works in Brooklyn, NY and is the director at Lesley Heller Gallery in Manhattan’s Lower East Side. Below the Surface opens at 440 Gallery, located at 440 Sixth Avenue on July 5 and will run through July 29. There will be an artists’ reception on Saturday, July 7 from 5 – 8 pm.